The Bhagavad-Gita, "Song of the Blessed One", forms part of the great Indian epic Mahabharata. Its 18 adhyaya chapters contain the report by Sanjaya of a dialogue between the Pandava hero Arjuna and his Yadu Charioteer Krsna, the eighth incarnation of Visnu. The actual fighting is about to begin when Arjuna feels revulsion at the leading part which he must play in the impending slaughter of cousins and kinsmen. The exhortations of Lord Krsna answer every doubt through a complete philosophical cycle, till Arjuna is ready to bend his whole mind, no longer divided against itself, to the great killing. The Gita has attracted minds of bents entirely different from each other and from that of Arjuna. Each has interpreted the supposedly divine words so differently from all the others that the original seems far more suited to raise doubts and to split a personality than to heal an inner division. Any moral philosophy which managed to receive so many variant interpretations from minds developed in widely different types of society must be highly equivocal No question remains of its basic validity if the meaning be so flexible. Yet the book has had its uses. If a Mahabharata war had actually been fought on the scale reported, nearly five million fighting men killed each other in an 18-day battle between Delhi and Thanesar; about 130,000 chariots (with their horses), an equal number of elephants and thrice that many riding horses were deployed. This means at least as many camp-followers and attendants as fighters. A host of this size could not be supplied without a total population of 200 millions, which India did not attain till the British period, and could not have reached without plentiful and cheap iron and steel for ploughshares and farmers1 tools. Iron was certainly not available in any quantity to Indian peasants before the 6th century BC. The greatest army camp credibly reported was of 400,000 men under Candragupta Maurya, who commanded the surplus of the newly developed Gangetic basin. The terms patti, gulma etc., given as tactical units in the Mbh did net acquire that meaning till after the Mauryans. The heroes fought with bows and arrows from their chariots, as if the numerous cavalry did not exist; but cavalry—which appeared comparatively late in ancient Indian warfare—made the fighting chariots obsolete as was proved by Alexander in the Punjab. The epic began, like the early Homeric chants, as a series of lays sung at the court of the conquerors. The lament was thinly veiled, presumably by irony; the defeated Kurus survived in legend (e.g. the Kuru-dhamma-jataka) as unsurpassable in rectitude and nobility of character. 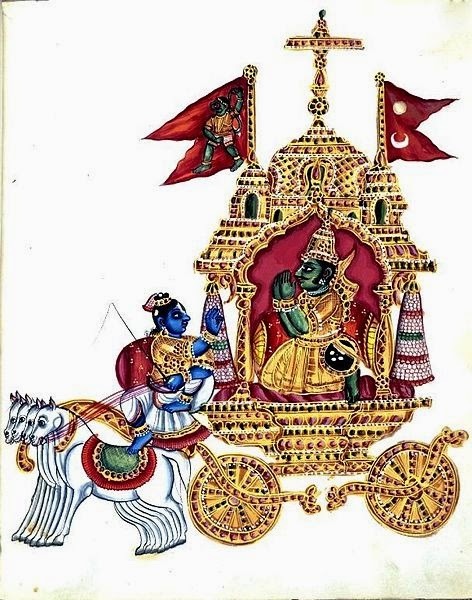 Krsna-Narayana had no role to play even in the first connected epic narrative. Should the reader doubt all this, let him read the final cantos of the extant Mbh. The Pandavas come in the end to disgraceful old age, and unattended death in the wilderness. Their opponents are admitted to heaven as of right, but the heroes are only transferred there from the tortures of hell, after a long and stubborn effort by the eldest brother Yudhstihira, It strikes even the mast casual eye that this is still the older heaven of India and Yama; Krsna-Narayana is not its dominant figure, but a palpable and trifling insertion in a corner. Those legendary Utopians, the: pure, and unconquerable Uttara Kurus of the Digha Nikaya (DN 32) and the Aitareya Brahmana (AB 8.14; H.23) are not to be confused with the Kurus who survived in historical times near Delhi-Meerut. The Buddha preached several of his sermons at the settlement Kammasa-damma in Kuruland (Majjhima Nikaya 10; 75; 106) white their capital seems 10 have been at Thullakotthita (MN 82), the seat of the nameless petty tribal Kuru chief, presumably descended from the Pan (Java conquerors whom the epic was to inflate beyond all limits. This negligible 'kingdom' either faded away or was among the tribal groups systematically destroyed by the Magadhan emperor Mahapadma Nanda, a few years before Alexander's raid into the Punjab. The memory, however, remains as of a tribe, but not a full-fledged kingdom with a class structure in the eleventh book or the Arthasastra along with similar oligarchies like the Licchavis and the Mallas known to have been destroyed about 475 BC. As for Narayana, it might be noted here, that the famous benedictory initial stanza Narayanam namaskrtya, which would make the whole of the extant Mbh into a Vaisnava document, was stripped off by V. S. Sukthankar's text-criticism in 1933 as a late forgery. 1 .1 FOR WHAT CLASS? We know that the Gita exercised a profound influence upon Mahatma Gandhi, B. G.Tilak, the 13th century Maharastrian reformer Jnanesvar, the earlier Vaisnava acarya Ramanuja. and the still earlier Samkara. Though both fought hard in the cause of India's liberation from. British rule, Tilak and the Mahatma certainly did not draw concordant guidance for action from the Glta. Aurobindo Ghose renounced the struggle for India's freedom to concentrate upon study of the Gita. Lokamanya Tilak knew the Jnaneswari comment, but his Gita-rahasya is far from being based upon the earlier work. Jnanesvar himself did not paraphrase Samkara on the Gita, nor does his very free interpretation follow Ramanuja; tradition ascribes to him membership of the rather fantastic natha sect. Ramanuja's Vahnavism laid a secure foundation for the acrid controversy with the earlier followers of Siva who came into prominence with the great Samkara. But then, why did samkara also turn to the Bhagavad-gita? What common need did these outstanding thinkers have that was at the same time not felt by ordinary people, even of their own class? They all belonged to the leisure-class of what, for lack of a batter term, may be called Hindus. The consequent bias must not be ignored, for the great comparable poet-teachers from the common people did very well without the Gita. Kabir, the Banaras weaver, had both Muslim and Hindu followers for his plain yet profound teaching. Tukaram knew the Gita through the Jnaneswari, but worshipped Visnu in his own way by meditation upon God and contemporary society in the ancient caves (Buddhist and natural) near the junction of the Indrayam and Patina rivers. Neither Jayadeva's Gita-govinda, so musical and supremely beautiful a literary effort, (charged with the love and mystery of Krsna's cult) nor the Visnuite reforms of Caitanya that swept the peasantry of Bengal off its feet were founded on the rock of the Gita. I have yet to hear that the heterogeneous collection which forms the Sikh canon owes anything substantial directly to the Gita, though it preserves verses due to Jayadeva, and the Maharashtrian Namdev. Jnanesvar ran foul of current brahmin belief at Alandi, and had to take refuge about 1290 AD on the south bank of the Godavari, in the domains of Ramacandra Yadava, to compose his famous gloss in the common people's language. We know as little of the historic action taken or instigated by Samkara and Ramanuja as we should have known of Tilak s had only his Gita-rahasya survived. Yet, about the year 800, Samkara was active in some manner that resulted -according to tradition—in the abolition of many Buddhist monasteries. That this was achieved by his penetrating logic and sheer ability in disputation is now, the general Hindu belief. The mass of writing left in his name, and what is given therein as the Buddhist doctrine which he refutes, make only one thing clear: that he had not the remotest idea of Gotama Buddha's original teaching. Buddhism as practised in the monasteries had in any case degenerated into Lamalsm with opulent vihara foundations which were a serious drain upon the economy of the country. That samkara's activity provided a stimulus to their abolition, and Ramanuja's some handle against the wealthier barons whose worship of Siva was associated in the popular mind with their oppressive land- rent, seems a reasonable conclusion on the evidence before us. Otherwise, it would be difficult to explain why the richer, aristocratic landholders opted for Siva, the poorer, and relatively plebeian overwhelmingly for Visnu, in the bitter smarta-vaisnava feuds, it is difficult to believe that they could come to blows because of differing religious philosophy.. Samkara managed to discover a higher and lower knowledge in the Upanisads which allowed him "to conform to the whole apparatus of Hindu belief "—whatever that may mean—"on the lower plane, while on the higher he finds no true reality in anything; his logic, it has been well said, starts by denying the truth of the proposition 'A is either B or not B'... At death the soul when released is merged in the absolute and does not continue to be distinct from it". According to Ramanuja, "if in a sense there is an absolute whence all is derived, the individual souls and matter still have a reality of their own, and the end of life is not merger in the absolute but continued blissful existence. This state is to be won by bhakti, faith in and devotion to God." It is not possible to imagine that subtle arguments on these tenuous ideas gripped the masses, that people could be whipped up to a frenzy merely by the concept of restricted dualism (visistadvaita) or thoroughgoing dualism (dvaita). Yet frenzied conflict there was, for centuries. Neither side objected to rendering faithful service at the! same time to beef-eating Muslim overlords, who knocked brahmins off without compunction or retribution, and desecrated temples without divine punishment. The main conclusion is surely the following : Practically anything can be read into the Gita by a determined person, without denying the validity of a class system. THE GITA FURNISHED THE ONE SCRIPTURAL SOURCE WHICH COULD BE USED WITHOUT VIOLENCE TO ACCEPTED BRAHMIN METHODOLOGY, TO DRAW INSPIRATION AND JUSTIFICATION FOR SOCIAL ACTIONS IN SOME WAY DISAGREEABLE TO A BRANCH OF THE RULING CLASS upon whose mercy the brahmins depended at the moment. That the action was not mere personal opportunism is obvious in each of the cases cited above It remains to show how the document achieved this unique position. That the song divine is sung for the upper classes by the brahmins, and only through them for otters, is clear. We hear from the mouth of Krsna himself (G.9.32): "For those who take refuge in Me, be they even of the sinful brands such as women, vaisyas, and sudras.." That is, all women and all men of the working and producing classes are defiled by their very birth, though they may in after-life be freed by their faith in the god who degrades them so casually in this one. Not only that, the god himself had created such differences (G.4.13): "The four-caste (class) division has been created by Me"; this is proclaimed in the list of great achievements. The doctrines are certainly not timeless. Ethics come into being only as they serve some social need. Food-producing society (as distinct from conflicting aggregates of food-gathering tribal groups) originated in the fairly recent and definite historical past, so that the principles upon which it may work at some given stage could not have been expressed from eternity. The Gita sets out each preceding doctrine in a masterly and sympathetic way without naming or dissecting it, and with con- summate skill passes smoothly on to another when Arjuna asks "why then do you ask me to do something so repulsive and clearly against this ?" Thus, we have a brilliant (if plagiarist) review-synthesis of many schools of thought which were in many respects mutually incompatible. The incompatibility is never brought out; all views are simply facets of the one divine mind. The best in each system is derived, naturally, as from the high God. There is none of the polemic so characteristic of disputatious Indian philosophy; only the Vedic ritual beloved of the Mimamsakas is condemned outright. The Upanisads are well—if anonymously—represented, though the Svetasvdara Upanisad alone contains the germ of bhakti, and none the theory of perfection through a large succession of rebirths. This function of karma is characteristically Buddhist. Without Buddhism, G.2.55-72 (recited daily as prayers at Mahatma Gandhi's asrama) would be impossible. The brahma-nirvana of G. 2.72, and 5.25 is the Buddhist ideal state of escape from the effect of karma. We may similarly trace other—unlabelled—schools of thought such as Samkhya and Mimamsa down to early Vedanta (G. 15.15 supported by the reference- to the Brahama-sutra in G. 13.4)-. This helps date the work as somewhere between 150-350 AD, nearer the later than the earlier date. The ideas are older, not original, except perhaps the novel use of bhakti. The language is high classical Sanskrit such as could not have been written much before the Guptas, though the metre still shows the occasional irregularity (G. 8. 101, 8. IP, 15. 3a, &c) in tristubhs, characteristic of the Mbh as a whole. The Sanskrit of the high Gupta period, shortly after the time of the Gita, would have been more careful in verification. It is known in any case that the Mbh and the Puranas suffered a major revision " in the period given above. The Mbh in particular was in the hands of Brahmins belonging to the Bhrgu clan, who inflated it to about its present bulk (though the process of inflation continued afterwards) before the Gupta age came to flower. The Puranas also continued to be written or rewritten to assimilate some particular cult to Brahminism. The last discernible redaction of the main Purana group refers to the Guptas still as local princes between Fyzabad and Prayag. This context fits the Gita quite well. The earliest dated mention of anything that could possibly represent the Gita is by Hsiuen Chuang, early in the seventh century, who refers to a Brahmin having forged at his king's order such a text, (supposedly of antiquity) which was then 'discovered', in order to foment war. The fact does remain that the Mbh existed in two versions at the time of the Asvadayana Grhya Sutra, which refers both to the Bharata and the Mahabharata" The prologue of the present Mbh repeats much the same information in such a way as to make it evident that the older 24,000-stote Bharata was still current at the time the longer version was promulgated. Every attempt was made to ascribe both to the great 'expander', Vyasa, to whom almost every Purana is also ascribed. A common factor is the number 18, which had some particular sanctity for the (whole complex, and for the Brahmins connected therewith. There are 18 main gotra clan-groups of brahmins though the main 751 sages are only seven in number; many of the 18 (e.g. the kevala Bhiargavas and kevala Angirasas) are difficult to fit into a rational scheme. Correspondingly, there are 18 main Puranas, and 18 parvan sections of the Mbh, though the previous division was into 100, as we learn from the prologue. The very action of the Bharatan war was fought over 18 days between 18 legions. The Gita has also 18 adhyayas, which is surely not without significance. That the older Bharata epic had a shorter hut similar Gita is most unlikely. One could expect some sort of an exhortation to war, as is actually contained in- G. 2. 37: "If slain, you gain heaven; if victorious, the earth; so up, son of Kunti, and concentrate on fighting'. These lines lit the occasion very well. Such pre-battle urging was customary in all lands at all times (advocated even by the supremely practical Arthasastra, 10.3) through invocations and incantations, songs of bards, proclamations by heralds, and speech of captain or king. What is highly improbable - except to the brahmin bent upon getting his niti revisions into a popular lay of war—is this most intricate three-hour discourse on moral philosophy, after the battle-conches had blared out in mutual defiance and two vast armies had begun their inexorable movement towards collision. To put it bluntly, the utility of the Gita derives from its peculiar fundamental defect, namely dexterity in seeming to reconcile the irreconcilable. The high god repeatedly emphasizes the great virtue of non-killing (ahimsa), yet the entire discourse is an incentive to war. So, G. 2.19 ff. says that it is impossible to kill or be killed. The soul merely puts off an old body as a man his old clothes, in exchange for new; it cannot be cut by weapons, nor suffer from fire, water or the storm. In G. 11, the terrified Arjuna sees all the warriors of both sides rush into a gigantic Visnu-Krsna's innumerable voracious mouths, to be swallowed up or crushed. The moral is pointed by the demoniac god himself (G. 11.33): that all the warriors on the field had really been destroyed by him; Arjuna's killing them would be a purely formal affair whereby he could win the opulent kingdom. Again, though the yajna sacrifice is played down or derided, it is admitted in G. 3.14 to be the generator of rain, without which food and life would be impossible. This slippery opportunism characterizes the whole book. Naturally, it is not surprising to find so many Gita lovers imbued therewith. Once it is admitted that material reality is gross illusion, the rest follows quite simply; the world of "doublethink" is the only one that matters. The Gita was obviously a new composition, not the expansion of some proportionately shorter religious instruction in the old version. I next propose to show that the effort did not take hold for some centuries after the composition. Myth and Reality: Studies in the Formation of Indian Culture (first printed in 1962). We have corrected the link. Go to the website http://www.arvindguptatoys.com/ . Then click the link for books and browse for DD Kosambi. Most of his works, including Myth and Reality, are available for download.